Beginning with the luxuriously comfortable mobile home that can be rented via LUX-camp, the Marina d’Erba Rossa luxury camping site offers every facility necessary for leaving those daily stresses behind. A huge freshwater, sparkling blue pool shaded by gently swaying, emerald green palms is only part of the available therapy. 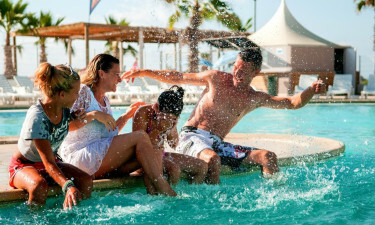 Step from the pool onto the warm, white and welcoming beach that has the azure waters of the Mediterranean lapping at its edges and you truly get to experience a camping holiday on a small piece of paradise. The magnificent coastal landscape and mountain views for which Corsica is renowned. A wellness and spa centre to take care of residual tensions. Regular shows, dancing and other entertainment. In keeping with its natural beauty, luxury camping here includes an animal park filled with indigenous animals that will thrill adults and children alike. The protected heritage sites of Ghisonaccia are also a mere 2 miles from this luxury camping site, which allows even greater encounters with nature, and access to more magnificent beaches. There are also other Corsican treasures to be explored for those who don’t mind travelling a little further afield. Ever-changing shapes and colours define the Corsican landscape, and camping luxury can include explorations of some of its mountains, lakes and rivers. Extensive pine forests cover the mountainous regions, and the route from the Solenzara River takes in natural pools and huge rock walls. Visitors to the Restonica Valley will discover Lake Melu and, above it, Lake Capitellu, which is the deepest lake in Corsica. 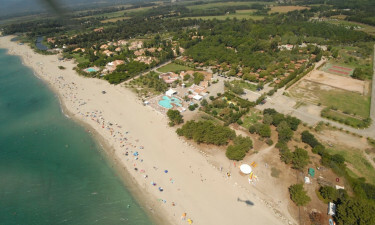 A camping holiday at Marina d’Erba Rossa provides plenty of the type of pampering expected from a luxury camping site. Committed staff at the Wellness centre of this holiday camping site will ensure that tensions and muscles that ache after a day of sporting activity will be soothed and bodies revitalised. For days when total relaxation is more appealing, campers can lounge around the pool on comfortable sun beds to soak up those warm rays and doze to the hypnotic sound of the ocean. The aroma of freshly baked breads and pastries waft across this luxury camping site every morning to satisfy those early hunger pangs. Besides the bakery, there is also a snack bar, a pizzeria, and an ice cream shop for anytime treats, while an on-site restaurant will temp the taste buds with delicious dishes and fine wines. A bar takes care of thirst with a variety of exotic cocktails and soft drinks. 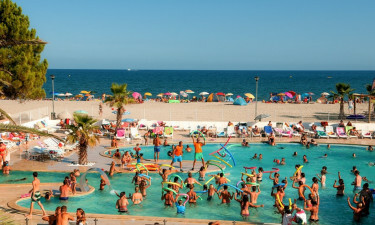 An on-site mini market offers foodstuffs and other necessary items, while a souvenir shop supplies plenty of reminders of a marvellous camping holiday. There is also a variety of fresh produce available at the quaint villages nearby.